The Beantown Bloggery: Did You Buy Anything This Weekend? This past weekend was the annual tax free weekend (here) in MA. I swung by the Natick Mall on Saturday and the Prudential/Copley Mall on Sunday to see if folks were out and about shopping. I also had a lil bit of shopping to do myself. Overall, the malls looked relatively empty. But there were a few stores that had more traffic than usual. The top 3: Sears, Apple, and Louis Vuitton. Folks at Sears were shopping for appliances like fridges and washing machines. 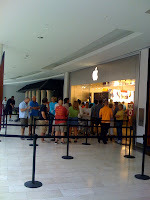 The line was OUT THE DOOR at the Apple store in Natick. They actually set up ropes. I guess it makes sense since their products never go on sale. May as well save the 5%. And lastly, Louis Vuitton was a mad house today in Copley - again stuff that never goes on sale so I guess you take what you can get. 1 Response to "Did You Buy Anything This Weekend?" No big purchases. Just a rearview mirror and a basket for my bike.